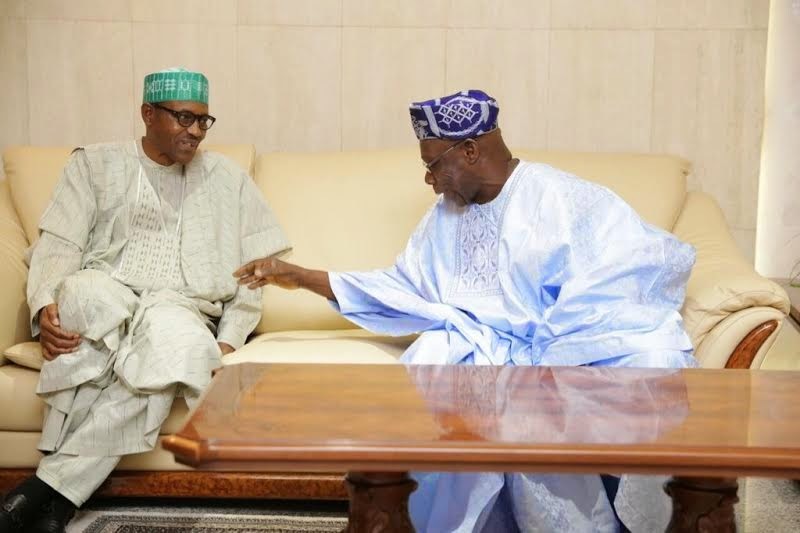 President Muhammadu Buhari and former President Olusegun Obasanjo on Saturday held a closed-door meeting at the Presidential Villa, Abuja. The meeting, SUNDAY PUNCH learnt, was held inside the President’s official residence. It was held away from the prying eyes of journalists. Our correspondent learnt that Obasanjo, who was decked in white agbada, arrived at the Presidential Villa for the meeting at about 1pm and left around 2.20pm. Details of the discussion between the two leaders were not readily available as of the time of filing this report on Saturday but the meeting, it was learnt, might not be unconnected with the “latest happenings” in the country. Although Obasanjo had visited Buhari about six times since he was inaugurated on May 29, 2015, that was about the second time he would be meeting the President inside his official residence. The first time such meeting was held in the place was on August 7, 2015. Obasanjo had between then and now met with Buhari inside his office three times. The meetings were held on November 10, 2015; April 7, 2016; and June 3, 2016. Out of the three, the former president only spoke with State House correspondents once, while he declined comments on the two remaining occasions.